The smoke surrounding rumors of an Apple-branded vehicle has begun to thicken, as a new report says that Apple is indeed working on an all-electric vehicle that would take the shape of a minivan, with a huge team tasked to the project. 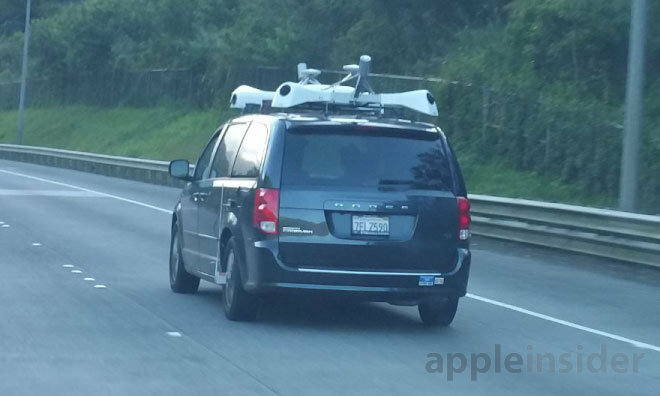 One of Apple's sensor-laden vans, spotted in Hawaii by AppleInsider reader matthawaii. Apple has given the project codename "Titan," according to the Wall Street Journal. The company is said to have "several hundred" employees working in the group. Apple CEO Tim Cook reportedly green-lighted the project almost a year ago, and company executives have already begun to meet with potential contract manufacturers, including Canadian firm Magna Steyr. Apple iPod and iPhone designer Steve Zadesky, formerly of Ford, is said to be running the project. The team— which has its own development facility away from the main Infinite Loop campus —could eventually swell to some 1,000 employees, and Zadesky has been given free reign to pull talent from any existing Apple group. Zadesky's group is reportedly researching "robotics, metals and materials consistent with automobile manufacturing." The Journal's report follows hours after a similar missive from the Financial Times, which revealed a "top-secret research lab" staffed with automotive executives. Among those who have made the move is former Mercedes-Benz R&D head Johann Jungwirth, who joined Apple as a Mac systems engineering leader last fall. Apple design chief Jony Ive is believed to have been personally recruiting automotive executives. Tesla CEO Elon Musk revealed earlier that Apple has tried "very hard" to poach engineers from the electric carmaker, offering $250,000 bonuses and 60 percent pay raises. Rumors of an Apple-branded vehicle have been around for years, but began to gather steam when Apple was revealed as the company behind a fleet of mysterious sensor-laden vans which have appeared around the U.S. in recent months. Those vans, which are almost certainly designed for data collection to augment Apple's mapping service, are unlikely to be directly related to any potential vehicle project, which is likely years away from production.